The Sightmark 7x Tactical Magnifier Pro offers versatility by increasing the magnification of accompanying sights for greater range and improved target acquisition. In one swift motion, the new flip mount design makes it fast and easy for shooters to increase their magnification for accompanying sights, creating a greater engagement range in any situation. 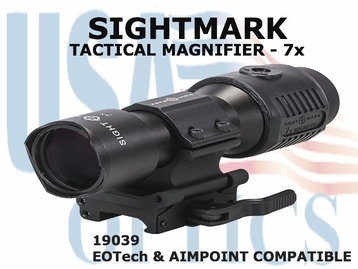 Offering the ability to quickly move the magnifier out of the way without having to detach the unit, Sightmark Slide-to-Side Tactical Magnifiers increase magnification of accompanying sights for greater sighting range and improved target acquisition. Each magnifier is designed for use with collimated reflex or other compatible weapons sights, giving the shooter the benefit of a reflexsight and scope in one combination.